Let’s face it, when watching a series from the era this show was produced you have to usually endure crude (by today’s standards) animation, poufy hairdos, and campy storylines. That’s not the case here, except for maybe the poufy hairdos. I never played the games that Ancient Books of Ys is apparently based on (nor have I even heard of them) but regardless this series stands on its own as one of the truly exceptional fantasy/adventure stories of its genre. The story premise isn’t anything that’s going to win award for originality. It’s your standard adventurer from another land who comes and is destined to save the world. We quickly get laid out the details and our hero, in this case Adol Christian is given a quest and each episode that follows is a fairly formulaic pattern. New allies are made along his quest which help Adol achieve his goals and make it the final battle with the villain. While the story is simplistic it does still manage to be interesting and it does give a lot of back story on the people and the land being saved. Despite being a short series I did find myself caring what happened to it and its people. The ending is a bit of a cliffhanger as it clearly sets up the scenario for part 2. 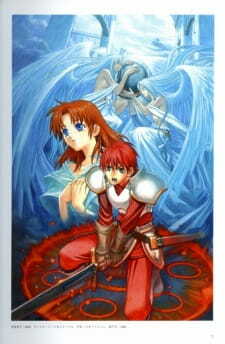 In any fantasy adventure like this one the action is very important, and there is a lot of it in Ys. The battles play out a lot like a fantasy RPG game would be expected to. In order to get a treasure, a boss monster must be defeated and that is pretty much how things play out. As Adol completes his quests his weapons and armor get better, again much like a game. The battles though are a bit disappointing though as they become a bit repetitive and basically are Adol getting beat up for a couple minutes until he figures out some new skill or power that allows him to be victorious. Characters in Ys are a win. Adol gets pretty well developed and we get a few pieces of his past but not a lot. He manages to grow over the course of the story and is a likable character that you want to cheer for. The supporting characters are fairly good; some are more interesting than others while some are pretty much just cardboard cutouts to fill the screen. Dogi is the best and he brings a lot of the comedy moments, makes a good sidekick like you would see in a 80s action movie. Animation and sound are difficult to rate. I have to remember that this show is almost 20 years old. I am sure at its time this was considered really good. It does hold up fairly well, I have seen far worse, later on in the decade but the characters are pretty simple looking and are colored with a dreary and dull pallet. However some of the backgrounds and terrain are very exceptional. Your either going to be ok with it or you’re going to think it’s incredibly crude. The music is very 80s, from the background music and sound effects to the ending song. The song isn’t that bad and I kinda liked it though. Overall this series is very good. I think it would have made a great longer series that would have allowed for much more story and character depth. Fantasy lovers should check this out without fail. Anyone else who is feeling nostalgic for older anime or likes an enjoyable and short show to watch should also give this a try. The plot fallows the same basic story line of the original game without to much variation. There are a few minor changes but nothing that would alter the story. As a devoted fan of the games it's only natural that I know and love the story very much. So a 9 on story from me. The sound is fine. But as the show is rather old the sound does leave a fair amount to be desired. I will say the sound effects are very nostalgic because they're old. But it's not up to the standards of today. A 6 on sound. (Music) There is no music section so I'll just say this here. The music is basically the music from the game just re-recorded and altered slightly for the show. But it's awesome to hear the music in the anime! If I could I'd give music a 9! The characters are all the same characters from the game and I love them all. Because it's a show we get to see more character development. Still not a huge amount but it's still very nice. And who doesn't love Adol and Feena and them? The character designs are also very nice, and generally very much like the game. An 8 on character from me. I enjoyed this hugely as an original old-school fan! It was great to see the game come to life like this. And even if you know nothing of the games it's still a great ride. ^__^ I would recommend this to anyone who likes fantasy. Taking everything into consideration I'll give this anime a 10. So I hope you all enjoy watching this as much as me! The Y's franchise may or may not be known to you. Basically, it's a series of action RPGs that helped define the genre back in the late 80s. It's also Falcom's best known franchise with around a dozen installments at this point but Falcom also doesn't have much else under their belts that's memorable and even their best known games aren't all that well known compared to a lot of other franchises from bigger name companies. Don't get me wrong, though, most of the franchise is made up of quality games. Back in the late 80s, when the series was in its infancy, Falcom worked with Tokyo Kids (a studio so minor they don't even have a wiki page) to produce OVAs for the first and second games. The first one being what we're going to look at today. Our tale opens with a traveler named Adol Christin trying to book passage to the land of Esteria, a land blocked by a tempest and rumoured to be overrun by monsters. He manages to break through the storm and reach the land, learning that the rumours were true. Furthermore, a young fortune teller named Sarah claims that his coming was foretold and that he can save Esteria, but first he has to go on a perilous journey to find the six books of Ys. Those of you familiar with the game will recognise the plot as will those of you who have never even heard of it. The story isn't exactly original. The whole “destined hero” storyline was really common when the game came out in the late 80s and it's remained so to this day. To be fair, the game was initially released back in 1987 when the technology was a lot more limited and there was only so much they could do with a game's story without sacrificing gameplay and the story itself, though nothing new, isn't badly told and does have some compelling dramatic moments and exciting adventurous moments. The pacing is mixed. The action does flow pretty well from one episode to the next without being overwhelming or rushed, but it's done at the expense of character moments. There's never much of an opportunity to get to know the characters or for the characters to develop since Adol has to move from location to location, action scene to action scene too quickly. As you can probably surmise, the characters in this aren't very strong. Take our protagonist, Adol. His motivations are really flimsy and he's just kind of a stagnant, generic hero. He doesn't know why he wants to go to Esteria and he supposedly doesn't believe the prophesy about himself, but he does exactly what the prophesy demands from him because... moon prism power. There's really no development between his doubts and his deciding to follow the path of the prophesied saviour. It just switches from one to the other without explanation. Our antagonist, Dark Fact, is just as bad. The only motivation we get from him is that some people are short-sighted and careless but that's a really weak justification for him to try to destroy everything. The art is pretty good. It definitely shows its age, but you can tell that a lot of time and effort went into the character designs and backgrounds. That being said, the action sequences over-use motion blurred backgrounds and the final battle sequence is kind of weak and anti-climactic. I have no complaints about the acting. They got some strong actors. Adol is voiced by Kusao Takeshi (who also voiced Cless in the Tales of Phantasia OVA.) It also features the vocal talents of Takayama Minami, Honda Chieko and Hayami Show, to name a few. The music is just really good. There is no ho-yay, or romance at all really. Ancient Book of Ys is a decent enough anime, if you want a simple adventure. Unfortunately, the characters are weak and the story has been done much better before and since. You should definitely see it if you're a fan of the game. If you just want a quick fantasy adventure it'll probably appeal to you too. Otherwise, there's not much of a reason to watch it. My final rating is going to be a 6/10. Next week, Doki Doki Precure. The story for this anime adaptation of the first installment of the Ys franchise widely known as Ys I: Ancient Ys Vanished is a good adaptation from a story standpoint. The progression and pacing all seemed on the money when it comes to everything important that needed to be covered in Ys 1. Obviously for anime purposes they couldn't make the authenticity of the video 100% accurate because certain scenes would probably have been more boring if that was the case. Example when Adol is venturing through the tower of Dahm he is accompanied by Dogi, Luther Gemma and Goban. In the video game Adol is by himself going in as Goban never came, Gemma was already locked in there (which was kind of right in the anime) and Dogi who was in there and didn't know who Adol was until he freed Adol when he was imprisoned by breaking through the wall of the prison he and Gemma were in by accident in the anime but on purpose in the video game. Obvious changes that I can list on and on but majority of them didn't hinder the authenticity of the actual story so it is mostly forgiven. One episode in particular I have to give some points to is episode 5 which is the episode where Adol meets the Tree that gives him the silver armor the info dump in this episode was presented (imo) better than the actual video game making it more understanding when it came to the origin behind everything in the story. The art and animation in this 1985 anime adaptation of a 1987 video game is not bad when you take into consideration of the time it came out. Majority of anime that came out in the 80s had this art style and animation which doesn't bother me, it's the art style and animation of the 80s and if you know that going in there you wouldn't be disappointed or disgusted unless you expected it to look like the cover picture on MAL or the don't like old style art style and animation. The sound for the anime is probably the best thing about this anime. I'm going through the Ys games and the only one I've completed is Ys 1 and another which isn't worth mentioning right now. All you need to know is as someone coming fresh out of Ys 1 and watching this anime I love the fact that majority if not all of the BGM that is played in the anime is remix BGM of music found in Ys 1. Every BGM that played during parts in the game plays during the exact parts in this anime and it's great from a adaptation quality stand point. The only reason I can't give this a 10 is the fact that I was watching the english dub version of the anime. And certain names aren't pronounced correctly as far as I know. Like Ahh-dol (As far as I know it's Aye-dol) and they go back and fourth between Dark Fact and Dark Factor those where the main two that threw me off and the voice acting is a bit dated but not bad when it take into consideration that this is from the 80s. Characters in the anime adaptation of Ys 1 is very good. Giving a personality to Adol a character which (if you only played the game) would never know how he is from a personality standpoint since he's presented to the player with a personality similar to a created character aka a personality that is hard to define. It is interesting to see how Adol acts since I personally didn't know until watching this anime and I felt they did a good job he isn't annoying, generic or boring which am grateful he isn't. Other characters since we know how they act in the video CAN be judged from a authenticity standpoint and everyone in the anime I felt was adapted perfectly except one character. This character is Dogi and I've only played Ys 1 (and Ys: Memories of Celceta which he's not in). And only going off of Ys 1 Dogi didn't really give off the same personality that he did in this anime. In the video I saw him has the muscle behind Adol sure but he never really gave off ANY signs of comedic relief in the video game. And in the anime he is obviously the comedic relief and this isn't a bad thing because at the end of the day it wasn't bad or annoying it was actually quite entertaining which I'm not TOO mad about it. BUT from an authenticity standpoint I felt it was incorrect characterization but it is what it is. I enjoyed the 7 episode anime adaptation of Ys 1, especially the music that was played in the background. Nothing more to be said it wasn't dragged on longer than it should have been either which is good since the video itself isn't that long to begin with. I felt this 1989 adaption of the 1987 video game Ys is a good adaptation with a few changes to make it have that anime feel but not enough to straw it away from being considered a good adaption for when it comes to an anime made two years after it's video game in the 80s because back then and even today anime adaptations of video games aren't done well.